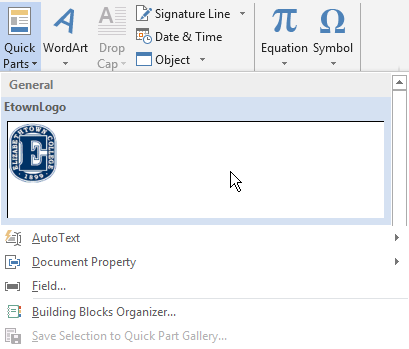 Turn the Etown logo (or any other image, text, signature block, table) into a Quick Part, and, with only two clicks, insert the logo. No more searching for the file or resizing it to fit. 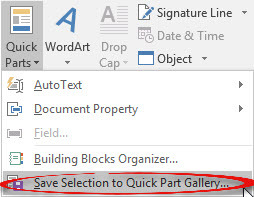 Quick Parts work in Outlook too. Step 1: In Word, insert the logo. Step 2: Because the logo from the original file is huge, resize the logo. Drag a corner handle to keep it in proportion. Otherwise you will get a "roadkill" effect.Step 3: With the logo formatted as you want it, select the logo. Step 4: Click the Insert tab. In the Text group, click Quick Parts. Step 6: Fill in the boxes for the Quick Part and click OK. Step 1: Position your cursor where the logo is to go.Step 2: Select the Insert tab, Text group, Quick Parts. 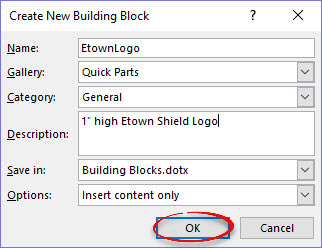 From the list, click on the Quick Part (EtownLogo in this example) Step 3: The Quick Part appears in the Word document. Any time you insert that Quick Part, it will always be the same size and look the same.